Show your clients the all-new 2017 AQUA Tower II models today! In appreciation of our Realtor friends who have helped us sell 79% of the residences, AQUA will pay a $25,000 Bonus to the 3 lucky Realtors who sell the next 3 residences! In addition, AQUA will work with you to create a personalized package for your customers so they also benefit during this developer close out phase. Door-to-Dock Lifestyle: Here, residents who purchase a boat slip (only 6 remain) at the marina can walk from door to dock, hop on their boat and take Wiggins Bay to the Gulf in just minutes! Maintenance-Free Living: Gated access, 24-hour attended arrival lobby and concierge services. Elite Amenities: Meticulously selected and pristinely preserved, amenities vary from movie theater and HD golf simulator to a resort-style pool and stunning 9th floor sky lounge. For your clients, every view and moment will be full of serene beauty and quiet elegance. And yet AQUA is just a short drive away from the best golf, dining, entertainment and shopping in Naples. Included in the 7 remaining residences are AQUA’s 3 new furnished models, all of which are available for purchase - some even with the potential short term leaseback opportunities. Also available is one of our palatial penthouse residences and 3 spacious move-in ready residences. 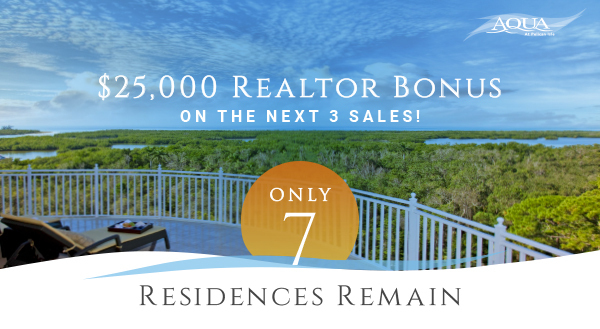 Don’t miss this opportunity to help your customers purchase a beautiful new waterfront residence, plus the advantage of your $25,000 bonus. Health is not a luxury. Trending in the Naples amenity-filled, luxury condo market is healthy living — both working out and eating healthy.